Kindle, Nook Coming to a Store Near You? Fresh rumors suggest that Amazon's Kindle and Barnes & Noble's Nook are both heading to a store near you. The Nook is rumored to be coming to Best Buy on April 18, while the Kindle is supposedly coming to Target stores one week later on April 25, according to two separate reports from Engadget. It may be just a coincidence that both e-readers are rumored to be branching out to more retail stores the same month that Apple launched the iPad. But the iPad, as well as other competing e-ink devices, may have pushed Amazon and Barnes & Noble to get more competitive in an increasingly crowded e-reading device market.? Amazon has never released figures to say how many Kindle devices it has sold, but it's likely that Amazon's online-only sales policy, which leaves potential buyers with no way to test drive the device, may have hurt Kindle sales. If the Kindle is coming to Target, that will make it much easier for people to play with the device, see what it's like, and get a feel for it before buying. I also have little doubt that any promotional materials used at Target will laud any features the Kindle has that the iPad doesn't. Don't believe me? Just take a look at this shot from Amazon's landing page on Thursday. 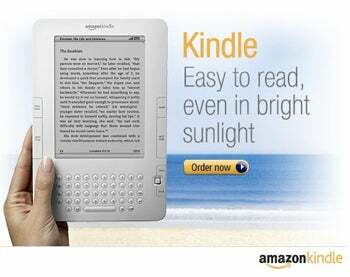 The first thing you see is a promotion for the Kindle boasting that you can easily read content on the device "even in bright sunlight." That advertisement is no coincidence, since one of the main criticisms against the iPad's e-reading functionality is that it's impossible to view the iPad's screen in direct sunlight. However, it should be pointed out that even if devices like the iPad ultimately kill Kindle devices, Amazon's e-reading business would still live on as a platform thanks to the many Kindle e-reading applications, including one for the iPad, available for mobile devices, PCs, and Mac computers. Like the Kindle, Barnes & Noble's Nook would also benefit from national retail distribution since the device is only available for sale online and at select B&N locations across the country. But since most B&N stores do have a Nook, you can at least try out before ordering online. That means that B&N's advantage from teaming with Best Buy may not be so much about getting people to try the device, but more about attracting a tech savvy audience. People come to B&N to browse physical books, and may not necessarily be interested in helping kill off the bookstore by buying an e-reader. But at Best Buy, B&N can more easily introduce their product to people who already embrace electronic gadgets.? But will larger retail distribution of the Kindle and Nook be enough to counter any threat from the iPad? It's too early to say how dominant (or not) the iPad will be in terms of e-reading, but the online ad firm Chitika believes there are already over 600,000 iPads sold just six days after the device launched. If those numbers are accurate, that means there are at least 600,000 people out there who may have given up on single function devices like e-readers in favor of the multifunctional iPad. It's not clear how many of those people are downloading the Apple's iBooks app or the Kindle app for iPad, but it's a good bet that widespread adoption of the iPad and iPad-like devices would not be a good sign for the future of single function e-ink devices like the Kindle and Nook.